CI-ONE has been chosen as the primary contractor on the project to build the One Nine Elms building after the work, worth £900 million, was put out to international tender. There has already been more than 12 months of work preparing the site, and construction work on the landmark development is now imminent. The project will take around 3 years before the property to let in Nine Elms is available. The chosen contractor, CI-ONE, is a collaboration between Britain-based company Interserve and the China State Construction Engineering Corporation (CSCEC). A well-known construction group in Britain, Interserve was named as Contractor of the Year at the 2014 Construction News Awards, being praised for its innovation and project delivery. CEO Adrian Ringrose was also awarded the Roll of Honour prize. He became the youngest ever chief executive officer of a FTSE 250 firm when he took control in 2003. Interserve’s history goes back as far as 1884, and today it employs around 80,000 people across the world and reported £3.4 billion of gross revenue in 2014. Its continued growth is demonstrated by comparing data from 2000, when the company employed just 10,000 people and had a revenue of £1.2 billion. CSCES is recognised as China’s largest construction company and is a specialist in high-rise buildings. This is appropriate given that One Nine Elms looks set to gain a place amongst the tallest residential projects in Western Europe when it is completed around the end of 2018. The Chinese corporation originally was owned by the state, and today generates around 800,000 jobs every year. It owns a broad range of residential and commercial properties, including cinemas and almost 100 shopping malls. 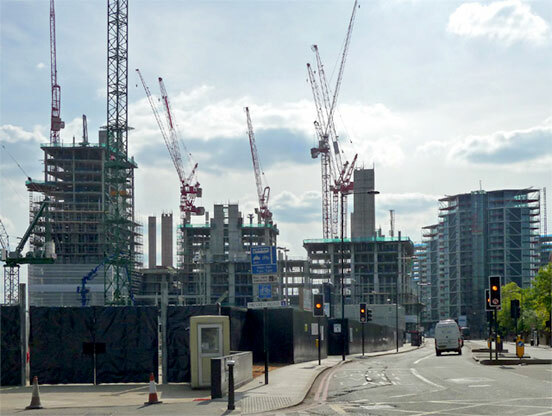 The One Nine Elms project was designed by international architects KPF and will stand at the edge of the Vauxhall Nine Elms Battersea Opportunity Area. Planning permission was granted in October 2012 to former owners Green Property Ltd to demolish the Market Towers on the site and to build two more towers to house a combination of residential apartments, retail space, offices and a hotel. Dalian Wanda bought the site in November 2013. If you cannot wait until 2018 to find your perfect property to let in Nine Elms, browse the current selection offered by Henry Wiltshire today.